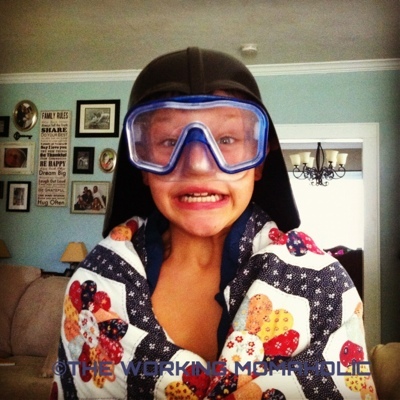 There are so many things, as parents, we want our kids to know before they start school. I’ve stressed over whether or not AH knows her colors, letters, numbers, etc. But now, being a teacher, I have a new perspective. So I’ve come up with a list of things I want AH to know before she starts kindergarten. 4. Wash your hands…don’t wipe them on your clothes. This is obvious in terms of keeping germ spreading to a minimum. But what I didn’t think of, as a parent, is how much gets on kids’ hands while at school. Paint, glue, markers, etc. All can get on clothes and ruin them if hands are wiped instead of washed. 3. Private parts are private. This is self explanatory. However, if your kid is like mine and prefers to hang out in his/her undies all day, you might want to ensure your child knows that home is the only place they can lounge like that. 2. How to tie their own shoes. If I had a quarter for every time I tied shoelaces during day, I might double my salary. This is going to be a challenge for AH. Mainly because most of her shoes don’t even have laces. 1. Bathroom Do’s & Don’ts – For instance: Don’t potty anywhere but the toilet (aka don’t write your name on the wall with urine). Do pull your pants up before exiting the bathroom (see number 3). And Do wipe yourself. If you don’t teach your child to take care of this on their own, trust me, they will ask teacher to do it for them. And when the teacher kindly declines, they may even ask to call you to come do it for them. True story. 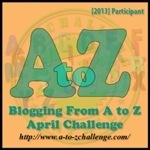 Brought to you by the letter F in the AtoZ Challenge. The last few days around here have been cold, gray and wet which means the worst thing possible to a Pre-K student…no recess. Yes, folks. His breath. He breathed in her direction. So, this morning, I was trying to get them all ready to recite the pledge. I was explaining what being respectful was and how we need to be serious when we say the pledge and listen to the Star Spangled Banner. Ok, I know, being the teacher, I’m not supposed to encourage him by laughing, but that was funny. And, hey, it’s better than hearing someone tattle on another student for breathing. I don’t think I could take too much of that. Has anyone ever noticed the impeccable timing of the once a year Girl Scout Cookie Sale?? I think it’s a conspiracy. What time of year do you resolve to eat healthier, exercise, become more fit? Oh, just around the time those clover green clad, smiley faced Girl Scouts start taking their cookie orders. You’d think this would hinder their sales. But no. Because, as Americans, when we feel one of our Constitutional Rights (such as The Right to Blow My Entire Paycheck on Thin Mints) is being restricted, we go out and buy as many boxes of silver-wrapped wafers from heaven that we can find. Take the recent frenzy about firearm regulations for instance. It’s madness. People everywhere are buying guns and ammo left and right. But I understand the uproar. Also? I feel obligated to confess that I have already placed an order for nearly $30 in cookies (though, it has been worse). When have you ever done or bought anything impulsively simply because you were afraid you wouldn’t be able to anymore? On the first day of this year’s Month of Thanksgivings, I am thankful for Band Aids. I’m not what I’d call a klutz but I pulled a stunt a couple days ago that makes me wonder. As I mentioned in my recent post, I recently became a school teacher. Which means I get recess! Okay, I don’t get recess but my students do so that means I spend some time on the playground, so to speak. Well, it was time to go inside, so I was calling to one of my kids over my shoulder (not watching where I was walking) and I totally ate it. I don’t mean a cutesy stumble then land on my rear. I’m talking head on, spread eagle, face down on the grass, scraped elbow and all. If you’re anything like me, this makes you laugh, almost uncontrollably. But I had to hold in the laughter because I’ve told my little ones that it’s not nice to laugh when someone is hurt. So, I dusted myself off, finished lining up my class and chuckled to myself all the way inside. Awesome. There are others who saw my fight with the ground and knew I took a beat down. 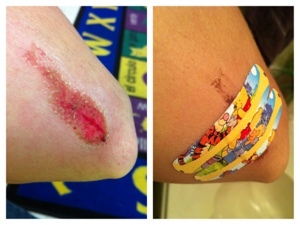 ‘Cause now I get to sport these nifty Winnie The Pooh band aids on my battle wound. AH tossed and turned all night with bad dreams. Even after putting her in bed with us, she kicked and whined. It was like watching a puppy when they’re sleeping and they suddenly start barking in their sleep; you wonder what it is they could be dreaming about. After trying everything to comfort her so she would be quiet so I could get some sleep sleep soundly, she was still stirring. And by stirring, I mean running her feet up my back as though she were climbing stairs. She was talking in her sleep, so I asked her what was wrong. I hoped that I could figure out what it was she was dreaming about that had her so upset. Because what’s more troubling to a 3 year than not being able to something by his/her self? So…this is what JD’s doing this morning. He chased Dashy around for a bit in this getup; the dog didn’t seem to find the humor in it. 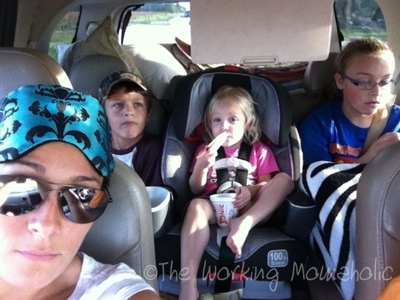 Here’s a peek at what the start of a family vacation really looks like. We’re loaded up and on our way to Jellystone Park, home of Yogi Bear, in Waller, TX. The Husband (not pictured) and I are exhausted and short tempered because it took an act of congress to get everyone and everything in the car and ready to go. AH just got caught taking off the lid to her Sonic drink (a BIG no-no) and put up a fight when we tried to take it from her so she wouldn’t spill it. You can tell by the look on her face she’s totally busted. LD is the texting machine in the back seat. She’s been in the car 2.65 seconds and already sent 3,619 text messages. In the very back, our family mascot, Dashy, is inside his kennel. And as I type this, he begins to gag.